The nice thing about most designs on Urban Threads is that they’re versatile. Don’t have an embroidery machine? No problem, stitch it by hand! Traditional enough for those who still like playing with pointy objects, and doesn’t require you to sell your firstborn just so you can stitch a few sweet designs. 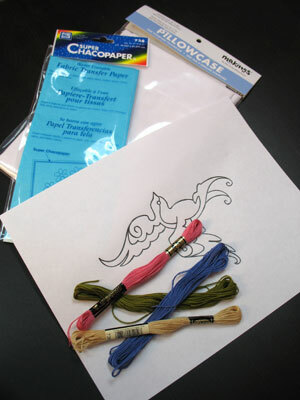 So, let’s start with the most common transfer method, with your run-of-the-mill "carbon transfer paper." Well, I think it’s run-of-the-mill, apparently my paper thinks it's "SUPER" chacopaper. Not quite sure what makes it super, but it says so on the package, and packaging never lies, right? We’ll cover a few other transfer methods after we check out our SUPER chacopaper, but in general, the things to keep in mind when transferring your design are whether it’s on light or dark fabric. Also check to make sure your transfer method isn’t permanent, unless you don’t care if your design marks stay on your fabric. 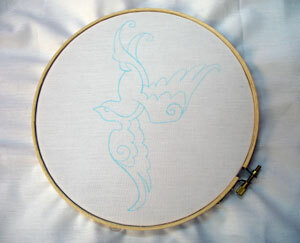 If you’re new to hand embroidery, pick a simple design with not too many tiny details. The difficulty level can vary with different designs, so use your astute powers of observation to decide which one is best for you. 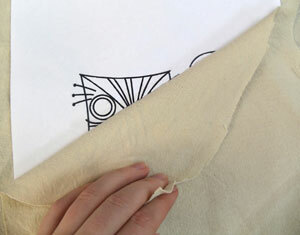 Take that carbon paper and place it carbon side down onto your fabric, then place your printed design on top of it. Keep in mind when you’re placing your image that you need enough room around it to be able to hoop the fabric, so don’t put it too close to an edge. Trying to transfer an image onto dark fabric? No problem! Carbon paper comes in different colors, and one of them is white. Using white carbon paper on black fabric with ensure your design comes through nice and clear. If you can’t find it in your local craft store, try online. This is one of the advantages of carbon transfer over an iron-on transfer, as most iron-on methods can only be used on light fabrics. 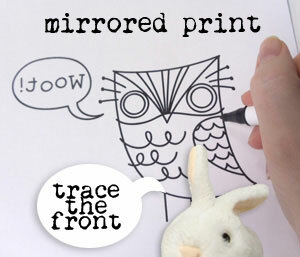 Use a pencil, stylus, or anything firm and vaguely pointy to trace over your design. Don’t use anything too sharp, or you might punch right through your fabric, and take extra care not to let your design move while you’re tracing it. I like adding a piece of masking tape to the top or side to keep it in place. Taking care not to shift your design, pull it back now and then to make sure your design is transferring properly. Mine comes out a nice pretty blue, light enough to be subtle but still visible. If you can’t see your design well enough, trace over it again. There you have it! 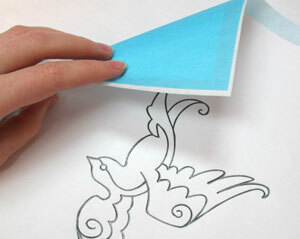 That’s the very common carbon paper transfer method. If you’re starting with a brand new transfer pen, the tip will be dry. 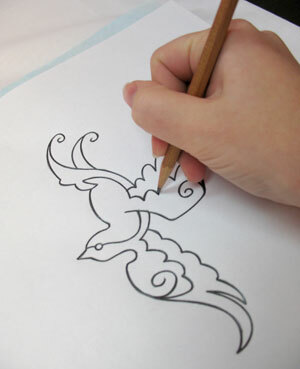 Hold the pen onto a blank piece of paper or scrap, and press it down a few times to start the ink flowing. Not too much! You don’t want to pool up excess ink. If it ever runs dry tap it once like that and the ink should return. My favorite way of using the transfer pen is by printing my design as-is, and then flipping it over and tracing onto the back. This is so when we iron it, it doesn’t turn out backwards. If you’re having trouble seeing through your paper, try holding it up to a bright window. If you’d prefer not to mess with the back, you can always trace over the front, but you have to mirror your image first (check out this tutorial to find out how). Keep in mind, if you’ve printed black and your transfer pen is black, it might be kind of tricky to see where you’ve traced already. 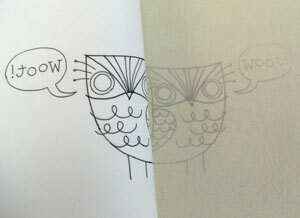 If you like, you can adjust the color or lightness of your print with some tips from this tutorial, so it’s easier to see where you’re tracing. 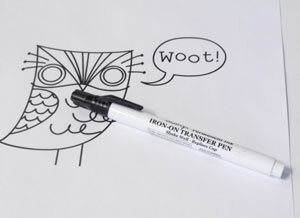 Are you working with a transfer pencil instead of a transfer pen? No problem! 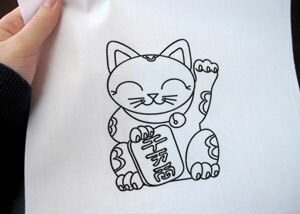 The technique is exactly the same -- trace the image and iron on. The only difference is the quality of the transfer of the two. Pencils tend to be much lighter (and sometimes a lot harder to see) but then the transfer is more invisible after it’s stitched over. It’s totally personal preference. If you’re just starting out, I’d recommend the pen, as it makes the clearest marks to follow. Most inks from laser printers or photocopiers can actually come off the paper when heat is applied. If that happens without a pressing cloth, that means you get ink right on your iron. Guess how the bunny knows this. So, if you need it, put a pressing cloth down. 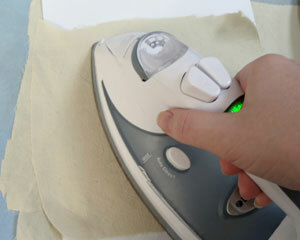 With a hot iron, carefully iron over your design, making sure it doesn’t move or shift while you’re ironing! To check your transfer, carefully peel back your paper every once in awhile to see how it’s coming through. You may need a lot of heat for it to transfer properly. Usually the cotton setting, no steam works best. 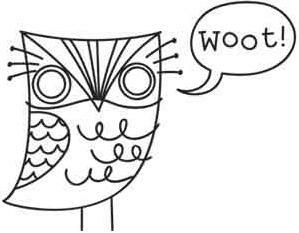 There’s our little owl! All neat and transferred over to our stitching fabric. Now, this doesn’t work terribly well, but if you have no other supplies and you really really need to stitch something, ironing a photocopy or laser print directly onto the fabric can leave a very faint transfer, like shown. Remember, you’ll want to mirror your design if you’re doing this! Don’t know how? Check out this tute. 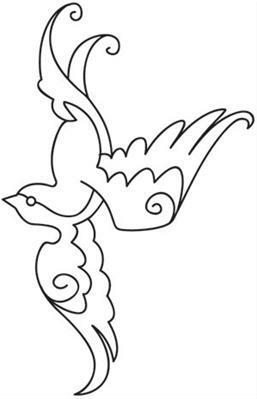 Don’t care for all that tracing? 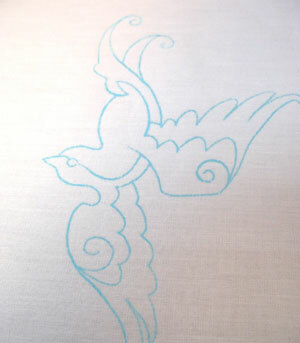 Well, another more permanent option is to print your design onto fabric, using inkjet fabric found at the craft store. The only problem with this method is your transfer lines are completely permanent, and pretty bold. 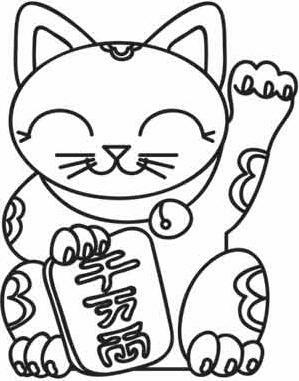 This is an example of a kitty if we printed him just as he came. You can lessen the impact of the transfer by lightening or changing the color, for example, making it a light blue like our other transfer often looks like. You will still have to stitch over every line to hide the transfer, but it should be less noticeable than a heavy black. 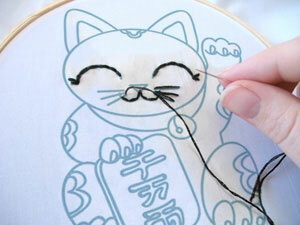 Want to know how to change the colors of a hand embroidery or stock art design? Click here for some tips from the bunny! 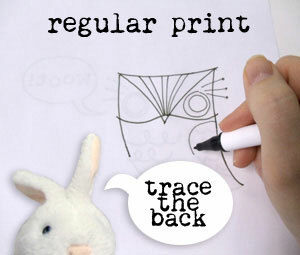 Want another method of transferring that doesn’t require tracing? There’s this neat stuff called Transfer-Eze!! It’s kinda like water soluble stabilizer. 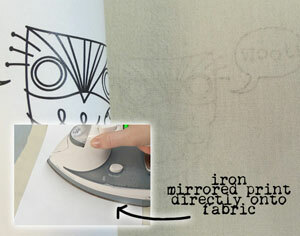 You print your design on it, peel and stick it onto your fabric, and dissolve it away with water when you’re done! Easy-peasy, and no transfer lines left behind when you’re done. So that’s it! There are all sorts of ways you can transfer your downloaded design, and you can choose which one works best for you. All you need to do now is find a hoop big enough to accommodate your spiffy stitches and you’re ready to stitch! 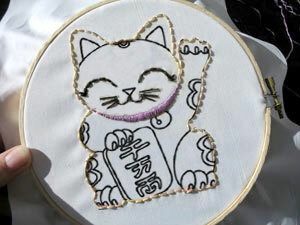 If you’re just starting out, you can check out this tutorial that covers some basic hand embroidery stitches, so you can start creating that embroidered masterpiece!